The CGS catalog reveals that we hold more than 90 books on Nevada, as well as more than 100 articles and 8 maps. I browsed one shelf in the main library, a small collection that includes two city directories, five hardcover books and one softcover. The latter has the intriguing title Rawhide. It was written by Hugh A. Shamberger and covers the early history, development and water supply for the historic mining camp of Rawhide, Nevada. Published in 1970, the well-illustrated volume was prepared by the Nevada Department of Conservation and Natural Resources and the U.S. Geological Survey. This fifty-page booklet was of particular interest to me personally because my paternal grandmother Anna Vetter and her older sister Kate lived in a mining town called Rhyolite, Nevada, before my grandmother met and married my grandfather in 1911. I have vague recollections of her having mentioned her time in Rhyolite and I have several black and white photos of Grandmother, her sister Kate, Kate’s husband and a few others that I am unable to identify. in this photo resemble those in some photos in Rawhide. Rhyolite is mentioned in the book and confirms my previous estimation of the time frame when my grandmother lived there. 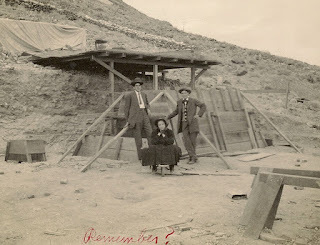 The mine started in 1904-1906 and I had estimated that Anna lived there ca. 1906-1910. So, why am I sharing this personal family story with you? To make the point that our wonderful library is very likely to have a book that will help with your family history and that you might find that clue in an unexpected place. That period of my grandmother’s life has always been a curiosity to me. I suspect this book on Rawhide will shed light on her story and help me understand why my grandmother spent time in Rhyolite. Two of our Nevada books address rather unique subjects. One is Yugoslavs in Nevada, 1859-1900 (1970) written by Adam S. Eterovich. The author has a delightfully funny writing style. In his introduction he admits that he first visited Nevada to try his luck at the gambling tables but found his interest piqued when he found not one but ten dead Slavonians in Virginia City. The Indian massacre at Pyramid Lake, social organizations, businesses, census, silver mines and mine owners, and gunfights, knife fights, killings and other disputes each have chapters in this book. This could be a goldmine – er, silver mine - for anyone with Slav roots. Another book on a somewhat unique topic is Jews in Nevada by John P. Marschall, published in 2008. Like Yugoslavs in Nevada, the book includes many illustrations and appears to be well researched. Check out our catalog for more on our Nevada holdings.